Who Invited This Kid Along? When is a Stephen King adaptation not a Stephen King adaptation? When it’s The Dark Tower, that’s when. Similar to the approach taken by titles like The Lawnmower Man, this attempted franchise is more “based” on the famous book series written by the noted horror author. In fact, it’s more a “continuation” of the mythology built up over eight novels, a comic book prequel, and an online game than a faithful recreation (that’s apparently coming with a tie-in TV series, if that even happens). And herein lies the problem. Fans of the novels will likely freak out over the liberties taken while enjoying the rare moments that match King’s psycho-surreal narrative. Those unfamiliar with the books may feel lost and left behind, their patience worn thin by incomprehensible story beats, limited characterizations, and an overall feeling of filmmaking by committee. 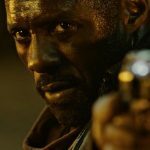 Indeed, The Dark Tower is already facing a barrage of negative buzz, from reports of poor test screening reactions and last minute editorial Hail Marys to the problem-plagued, decades-long desire (and failure) of others like Ron Howard and J.J. Abrams to bring the material to life. The result is a mishmash of genres which serves none of them, a limp and uninspired turn by Oscar winner Matthew McConaughey, and a YA angle that totally misunderstands the entire concept of King’s narrative. We are introduced to ”The Man In Black,” aka Walter O’Dim, aka Walter Padick (McConaughey) as he is trying to harness the power of psychic kids. He wants to use their gifts to destroy the Dark Tower. Apparently, the gloomy effigy is the key to keeping all the parallel universes and worlds in check. Without it, these places (including Earth), will be overrun by evil and monsters. His lifelong nemesis is Roland, The Gunslinger (Idris Elba, by far the very best thing in the film), who spends his time tracking the dark dude while protecting the Tower. When a little boy with special abilities named Jake Chambers (Tom Taylor) crosses their paths, the trio are headed for a clash that could destroy everything we know, and somethings we don’t. It’s the kid’s fault. 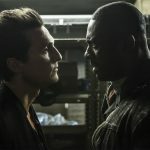 That’s the biggest problem with The Dark Tower. McConaughey may be on cruise control, waiting for his paycheck to clear, and Elba is definitely giving it his all. But little Tom Taylor is a cipher, a bland, boring protagonist that can’t carry a proposed epic like this. Originally, King made this Roland’s story, a complicated quest that actually tried to explain the abundance of bad in the world (among many other things). This version of The Dark Tower is just good vs. evil with a child at the center and a bunch of mediocre CGI creatures on the sides. There is nothing here, save King’s novels, that suggest the story should continue, and we aren’t invested enough in the events that happen to hope for a sequel. Don’t be mistaken, though. 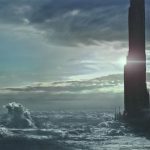 The Dark Tower is not an all out disaster. Instead, it’s a big missed opportunity, another example of what happens when you allow a hack like Akiva Goldsman anywhere near your project (he’s a producer, as well as one of four credited screenwriters–sigh). Everything has been homogenized and boiled down to basics, draining all the imagination and invention King brought to the material. Director Nicolaj Arcel is also to blame, his obvious inexperience with something of this scope proving a poor substitute for those who originally wanted to sit in his chair. Granted, the post-production tweaking doesn’t help his cause, but then again, nothing about this movie works to its advantage. Only Elba comes out unscathed, but it’s way too little, far too late. Fans have faith that, one day, King’s work will find a translation that does the author’s amazing skill at storytelling justice. Sadly, The Dark Tower is not it.